Fallas seems as though it were just yesterday, but there can apparently be no rest in this city. 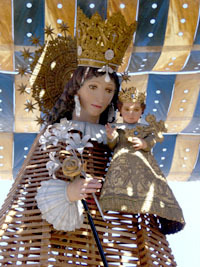 On the second Sunday of May, the festivals celebrating Our Lady of the Forsaken (La Virgen de los Desamparados) begin. Actually, the festivities truly begin the day before. Mostly for ourselves, we’ve compiled a list of events ordered by day. Planning begins now! Use this as your cheat sheet to the party. And don’t forget that we’re “Virgen de los Desamparados”-virgins, so let us know if we’ve got any information mixed up or have forgotten something important. Their will be crowds accumulating from 8pm onward, but the true action won’t begin until around 11pm. The Traslado: the move of the Virgin from the basilica to the nearby cathedral at 10:30am. Hordes of believers will be doing their best to touch Her Holiness during the move. At 18:30 is the Official Procession, during which thousands of Valencians in traditional garb will be parading down the streets, while onlookers shower them with rose petals thrown from balconies. Traditional Market in the Plaza de la Reina (location), lasting all day. Festival of the Florists, during which the temple will be completely adorned with flowers. Besamanos Público which marks the end of the festival. Unbelievable queues of people wishing to kiss the hand of the Virgin will form, beginning at 7am. 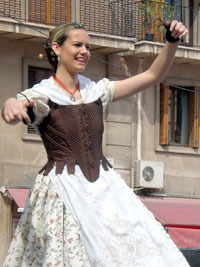 Of course, there are daily events during the course of festival, but most are entirely religious and boring not for us. Those listed above seem to be the highlights. Most of this information comes from ValenciaValencia.com, Wikipedia (in Spanish), and the basilica’s webpage which contains an exhaustive list of events.